(Newser) – The next time an asteroid is on a collision course with Earth, the UN wants to make sure someone calls Bruce Willis. The General Assembly last week gave the green light to an asteroid defense plan drawn up by the former astronauts at the Association of Space Explorers, Scientific American reports. The plan calls for member nations to join forces in an "International Asteroid Warning Group" committed to sounding the alarm if a dangerous rock is spotted. A spacecraft would then be launched to knock the asteroid off course. The ASE also wants the UN to run a practice deflection mission, to make sure the method actually works. And an asteroid collision with Earth is less important than humans? I say it's the only way humans are going to possibly change and do things better than they do now. Set up the lawn chair, slather on the sunscreen, put on the sunglasses and enjoy the show. What?! When was the last time YOU were at a significant moment in human history? Who is going to save us from the UN???? Wasn't it a year ago the NSA got wind that Iran was planning a space mission of their own to see if they could deflect a medium sized asteroid toward Earth and cause a Russian meteor type incursion over D.C. The key is to have absolute accuracy so that you don't deflect it to fall over Tehran. It could be feasible that the one that hit Russia was caused by Iran. Another key is to make sure you don't deflect one large enough to cause a shockwave that goes around the world and eventually impacts Iran in a bad way. 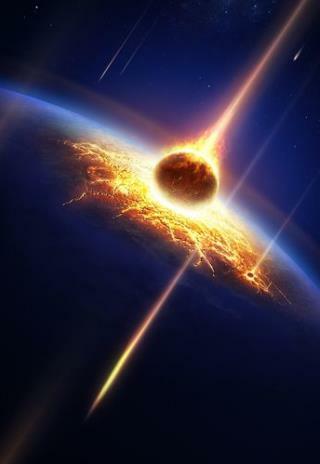 You would want the meteor to hit with less than 200 megatons of energy. If you did that, you could feasibly wipe out the entire eastern United States.